With FE, you will be able to access workers in their field in real through a range of different technology including smart phones, tablets and of course, user websites. As well as this, Field Engineer provides a number of key benefits that make management simple. You can track workers who are in the field and provide the assistance they need. Through the same solution, you will be able to manage work orders, handle dispatches and create mobile payment plans. You can even access reports and analytics to see how effectively field workers are handling jobs in your business. Your customers want a fast service that is cost effective. Your employees want to make sure that they can meet revenue targets while keeping management issues simple. With FE, both groups will be completely satisfied with your service. You will be able to keep the costs low and jobs fast to maximise the potential of your business. You might be wondering what type of jobs field engineers can perform for your company. 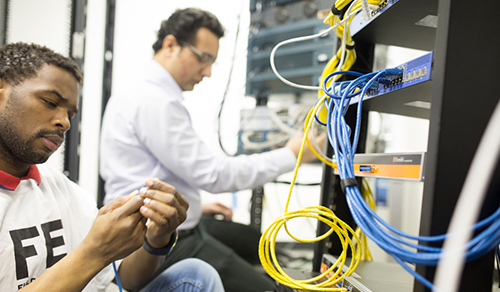 AT FE you’ll find experts ready to handle a variety of tasks for your business including equipment installations, circuit installations, security fixes, network setups and much more. Using our Field Service Management Solution, you can gain access to the engineering experts you need and deliver the quality service clients demand.